According to the NOAA, October 2015 was ranked 102 out of 121 for precipitation. 5.5x as much rain as 1952. Permanent AGW Drought? Bull****. Take a look at all the green states. Green is near record rainfall. Light green is much above normal. 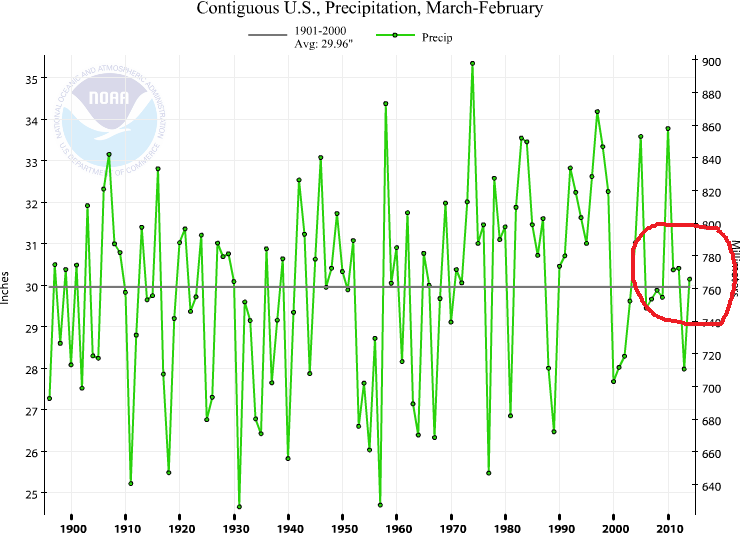 USA NOAA May 2015 – Highest Precipitation Ever in May!!!!!!!!!! 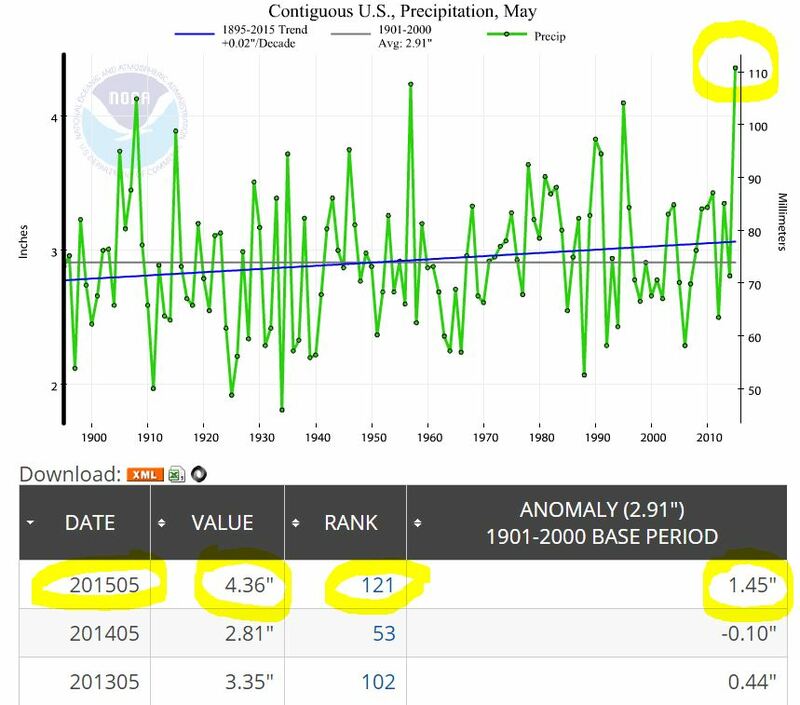 According to the NOAA, May 2015 was ranked 121 out of 121 for precipitation. Highest Ever Precipitation in May!!!! Remember when “drought was the new normal”? According to the NOAA the first two months of spring were 0.15″ above the 1901-2000 average. In other words … Normal! Most of the country is normal. Northwest and southeast are wetter. Middle south is drier. 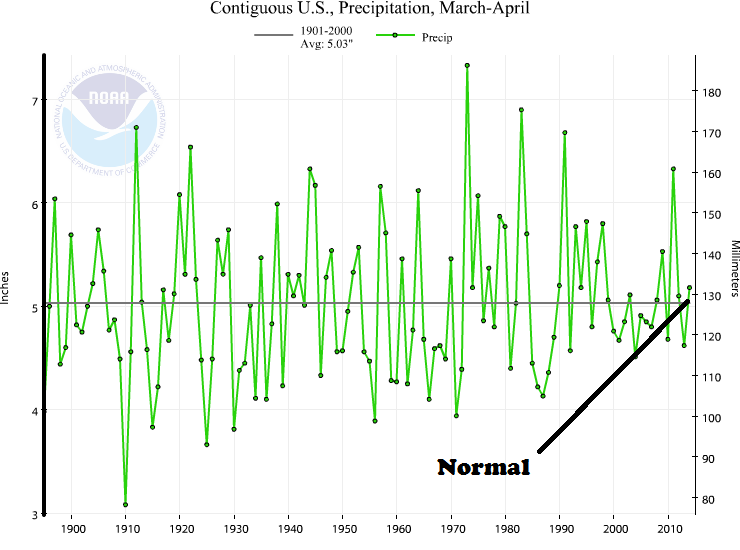 I missed this when it came out last month, but according to the NOAA Precipitation for the 12 month period ending February 2014 was normal. It was .19 inches above the 1901-2000 mean. Wasn’t there supposed to be a permanent “Climate Change” drought? Climate Change … bringer of slightly more precipitation. 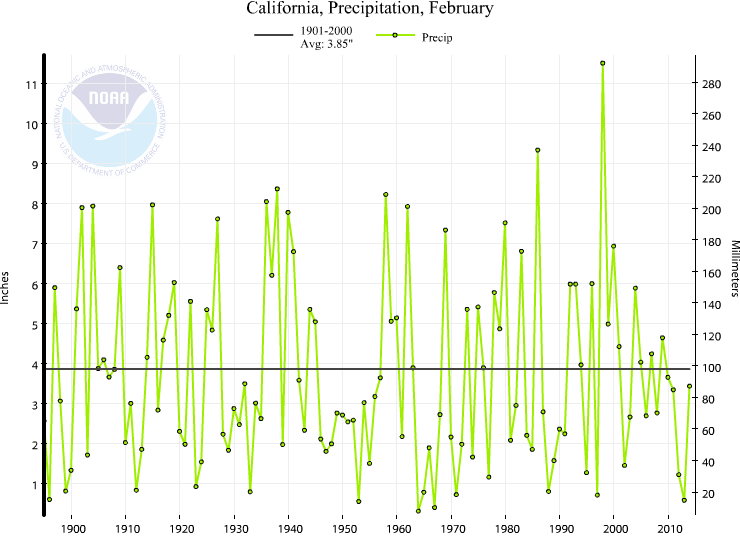 According to the NOAA, California averaged 3.43 inches of rain in February 2014, which was only .42 inches below the 1901-2000 mean. That is about 5.7X as much rain compared to January when California only averaged only .6 inches of rain. One month of average rainfall won’t end a drought, but it sure helps. With all the claims about 2012 being the worst drought in USA history (total joke), I thought I would mention that July 2013 was the 5th wettest July ever according to the NOAA. Only 1950, 1958, 1992 and 1915 were wetter. July 2013 was .71 inches above the 1901 – 2000 average. July 1930 was the driest. 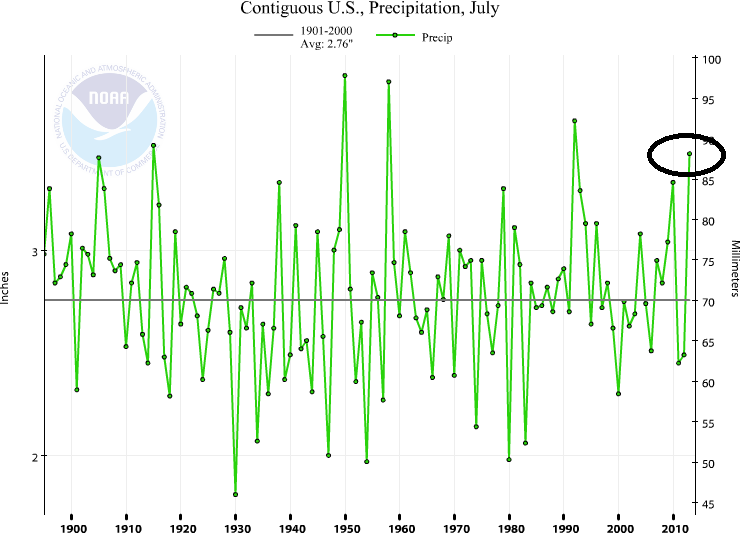 The 1895 to 2013 trend for precipitation in July is 0. Flat. No trend at all. Perfectly average. Year To Date precipitation for 2013 is 23rd wettest. 1.54″ above the long term average.